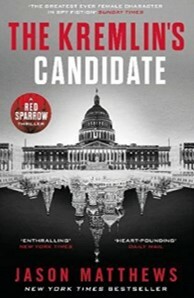 The Kremlin’s Candidate is a modern spy thriller, and the third installment in the “Red Sparrow” series, with the eponymous titled debut appearing as a recent film adaptation featuring Jennifer Lawrence. The jacket-copy makes much of the author’s background, as well it might. Mr Matthews was apparently an Operations Officer for the CIA for some 33 years, working mainly in the field of “denied areas” operations overseas, as well as recruiting spies. Which sort of leads me to believe that whatever his real name may be, it’s probably not Jason. I have not read any other books by him, so this book was picked up cold. It didn’t matter; it did work well as a standalone story. I really enjoyed it - with reservations. The plot is pleasantly convoluted. Colonel Dominika Egorova is a highly respected “Red Sparrow”, trained as a honey trap specialist - but she hates the job and wants to escape into different roles. However, in 2005 she succeeded in catching a US Navy Lieutenant Junior Grade, Audrey Rowlands. This success was to have dramatic results later, when Admiral Rowlands was suddenly in a position which could result in her becoming the next head of the CIA. Egorova has escaped her first job, and has risen through the ranks to become the head of Russian Counterintelligence. Not only that, she has also attracted the attention of Putin himself. And at the same time, she is a CIA agent, deeply embedded in the new groups which run Russia. However, if the Kremlin’s favorite candidate for head of the CIA wins the top job, Egorova will be in great danger. The new head will have access to all the files about agents in foreign countries, and that means Egorova will be burned. I should just say that all this is culled from the jacket, I’m not giving anything away. So, what did I think of the story? The book is full of events. The action moves from Russia to the US, to Vienna, to Turkey, and beyond. It has technology, and more acronyms than I could possibly remember. The pace was fairly good, because a spy thriller that moves slowly won’t work for a modern audience, but I did get the feeling that there was a fair bit of repetition - this reader got the feeling that he was being force fed too many details. A bit more judicious editing would have helped here. I did feel that if I heard how messy Benford’s office was one more time, I’d throw the book across the room. There were aspects of the book which I did not like. First, the use of foreign language. Whenever the action moved to a new location, the author seemed to feel an urge to use Russian, or Chinese, or Turkish words immediately followed by an English translation. Before I’d read the first ten pages, this was annoying me. It really felt like the author was smugly showing how much foreign language he knew. I counted 15 in the first 4 pages. Second, for some reason best known to himself, the author has chosen to deliberately mention food of some sort in each section, so that at the end of the chapter he can throw in a recipe. In the first section there’s a recipe for Russian Tea Cakes; Chapter One has “Ioanna’s Lemon Meatballs with Celeriac”; then there’s Magnit’s Spicy Thai Cucumber Salad” … and so on, interminably for every one of the 38 chapters. I have to ask: “why”? It seemed to me that this was a gimmick that appealed to the author originally, and he feels the need to keep it up into this third book in his series. Personally, I’d ditch it. There were several chapters where it felt as though the author threw in mention of a meal or specific food just because stylistically he had to. By all means have a list of recipes at the end of the book for those who’re interested, but inserting them at the end of every chapter just felt silly. There is one other thing I feel I have to mention, and that is synesthesia. This is a condition in which someone will, for example, associate a color with a word, or a number. I won’t go into detail here, but in this book, which is logical and rational on almost every level, the Red Sparrow is introduced as having a form of synesthesia that allows her to see a person’s character, their trustworthiness, feelings, and everything, as a colored halo over their heads, or, in the case of a nasty man, a pair of “bat-like” black wings. Sorry, but that turns the story into science fiction for me. So I have a list of things that niggled, grated, irritated, and distracted unnecessarily. However, would that stop me recommending the book? No. It will appeal to many readers. The story is a good one. Yes there are weaknesses, but almost every book has them. The main thing is, the plot is strong and the characters are believable. As for the other aspects, well, yes, repetition is annoying, but I just found myself jumping a couple of paragraphs when it got to me. The same goes for the use of foreign languages, the recipes etc. For those who like fast, action-based spy thrillers, this will be gobbled up in a hurry. However, if you’re a fan of John le Carre, you may not be quite so keen.